The watershed transform is commonly used as a starting point for many segmentation algorithms. However, without a judicious choice of seeds, it can produce very uneven fragment sizes, which can be difficult to deal with in downstream analyses. 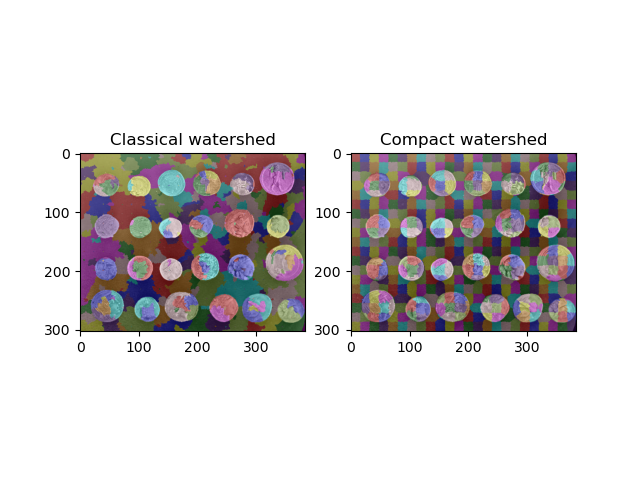 The compact watershed transform remedies this by favoring seeds that are close to the pixel being considered. Both algorithms are implemented in the skimage.morphology.watershed() function. To use the compact form, simply pass a compactness value greater than 0.